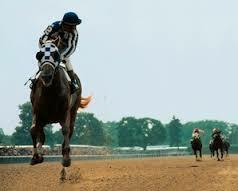 The movie, Secretariat, opened September 30, 2010. We were at the theater to see it and we weren't disappointed. In fact, it was even better than I imagined it would be. That was almost seven years ago and other than occasionally listening to Oh Happy Day, by the Edwin Hawkins Singers, I've had no contact with the movie since. For some reason it came up in conversation last weekend and we decided to watch it again. Once again we were inspired by the story and blown away by the presentation. And then we received a bonus. At the end of the credits, long after we had left the movie seven years ago, a song from the movie's sound track played. A song that retold the story of the magnificent horse, and at the same time, promised the same glory for anyone who would understand and act on its message. This time we heard it. Now you can hear it. "You Choose Your Race And Then You Run." If life can be reduced to a two-step process, that's it. Other factors, subsets of those two steps, often keep us from appreciating the simplicity of the process. For example, years of conditioning can keep us from seeing that the choice of the race we'll run is our choice. When we lose sight of that, we often let someone or something else choose our race or even worse, we don't make a choice at all - we stand off-stage waiting for the final curtain. And then there's the running or to be more exact, there is how we run. Again, we are often overwhelmed by choices: just get by or go all out; run strong to the end or quit at the first sign of trouble. The choices are ours and not making a choice is one of the possibilities. How we execute the choice we make is also ours, even when we allow something outside us to set our pace. Keep it simple - and have fun. PS: Here's a tribute to Secretariat you might enjoy.